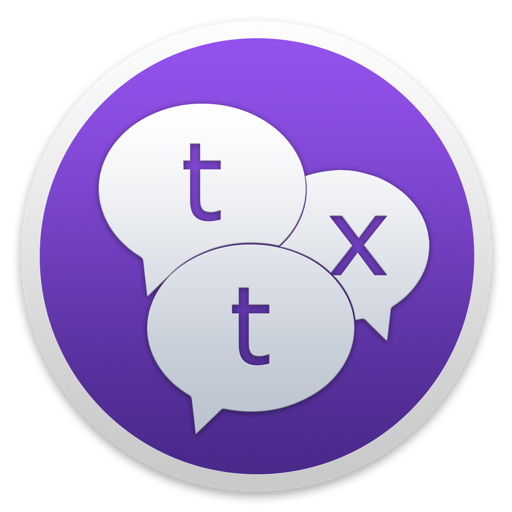 Textual is the world's most popular application for interacting with Internet Relay Chat (IRC) chatrooms on OS X. • [CHANGED]: The confirmation dialog for quitting Textual no longer appears unless you are connected to IRC. • [CHANGED]: Any file that is executable will now be treated as a script instead of files with specific extensions. • [CHANGED]: The NICKLEN configuration option of RPL_ISUPPORT is no longer enforced due to significant compatibility issues. • [CHANGED]: Styles bundled with Textual now declare the supported-color-schemes property to define the appearance of scrollbars on versions of macOS that support it. • [FIXED]: Fixed trust dialog for invalid certificates not appearing when one is encountered. See textualapp.com/changes for history of changes. 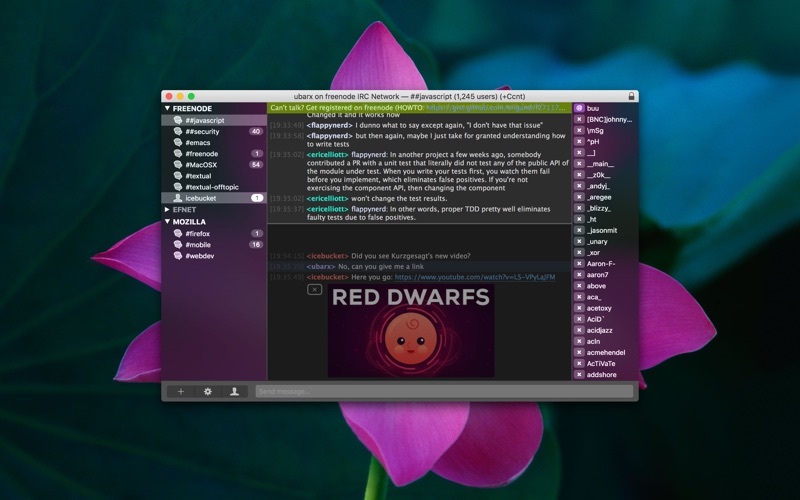 The entire user interface of Textual, from the smallest window to the largest, has been refined to take full advantage of the dark appearance of macOS Mojave. Additionally, Textual can now be configured to automatically inherit your Mac's appearance to avoid the unnecessary burden of changing it in two places. To do this, change the “Main window appearance” preference in the Interface section of Preferences to “Your Mac's Default”. This is the default for new installations. Existing installations will default to the appearance that was configured before upgrading to macOS Mojave. A new way for apps to establish connections, referred to by Textual as “modern sockets”, is available in macOS Mojave. When conditions are right, Textual will use this to connect to IRC. Modern sockets can't be configured to prefer IPv4. To accommodate users that want this behavior, the “Prefer IPv4” preference has been replaced with a preference to enable only IPv4, only IPv6, or enable both. Users that had the old preference enabled will be automatically migrated to only IPv4. See the Network Socket section of Server Properties. An indicator now appears in the scrollback when the day changes. This indicator can be toggled in the Style section of Preferences. • [ADDED]: Added spoiler formatting option which is compatible with other apps. • [ADDED]: Added support for chghost capability. • [ADDED]: Added preference to the Flood Control section of Preferences that can used to add a delay before automatically joining channels. This preference defaults to no delay. • [ADDED]: Added support for color codes 16 through 98. Click “More…” in the color formatting menu to access these colors. • [ADDED]: Added inline image support for speedtest.net results. • [CHANGED]: Tweaked the appearance of the application icon. • [CHANGED]: Errors in Server Properties, Channel Properties, and related windows are now much more descriptive. • [CHANGED]: Simplified some menus to make them easier to navigate. • [CHANGED]: Log files are now automatically closed after 20 minutes of inactivity. • [CHANGED]: Log files are now automatically closed if there isn't enough space available for them. You will be alerted of this. • [CHANGED]: File transfers are now automatically stopped if there isn't enough space available at the save location. • [CHANGED]: The “lagcheck” and “mylag” commands now work regardless of whether automatic Client-to-Client Protocol (CTCP) responses are enabled. • [CHANGED]: The channel quick select window is now detached from the main window. It can be dragged around and will remain on screen until escape is pressed. • [CHANGED]: The following RPL_ISUPPORT configuration options are now correctly handled: AWAYLEN, EXCEPTS, INVEX, KEYLEN, KICKLEN, STATUSMSG, and TOPICLEN. • [FIXED]: Fixed the “clearall” command not working correctly. • [FIXED]: Fixed the “conn” command not working correctly. • [FIXED]: Fixed running timers not being stopped when disconnected from IRC. • [FIXED]: Fixed incorrect implementation of RPL_REDIR. • [FIXED]: Fixed a crash that may occur when using the “keyx” command. • [FIXED]: Fixed Preferences window reopening at incorrect location on screen. • [FIXED]: Fixed some alerts not displaying a “Do not show this again” option when they are supposed to. [NEW] Added preference to Interface section of Preference that allows multiple channels to be viewed left to right, instead of top to bottom. [FIXED] Fixed inability to read or write preferences on macOS High Sierra. [FIXED] Fixed trial expired message appearing even after Textual was purchased. [NEW] The style “Sulaco” authored by Ryan Grove has been added to the list of default styles. [NEW] Added a “Current Session” marker to indicate where messages from the previous session end. [NEW] Added “Jump to Present” action to Navigation menu which can be activated using the keyboard shortcut Control Command B. This action jumps the scrollback to the most recent message. [NEW] Added “Jump to Current Session” action to Navigation menu which can be assigned a keyboard shortcut. This action jumps the scrollback to the “Current Session” marker. [NEW] Added “Only play back messages you missed” preference to the ZNC Bouncer section of Server Properties. This preference, which is enabled by default, controls whether the entire playback buffer or only the parts you missed are played back when the playback module is installed. [CHANGED] Connection names are no longer forced uppercase when Textual is running on OS X Yosemite or later. [CHANGED] Connections now gracefully disconnect when your Mac goes to sleep even if the preference “Perform reconnect when waking from sleep” is disabled. 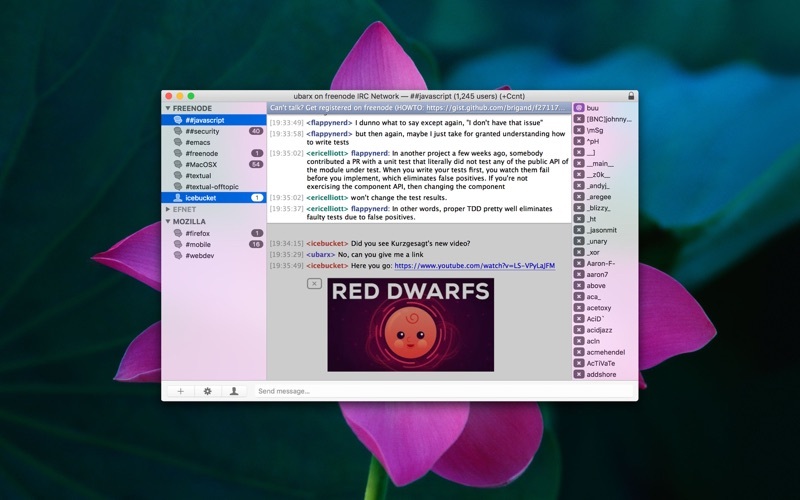 [CHANGED] Textual will now wait for images to be 100% loaded before they are shown inline with chat. [FIXED] Fixed scrollbars appearing invisible (plain white). [FIXED] Fixed a crash that may occur when iCloud syncing was enabled. [FIXED] Fixed inability to save trust for a self-signed certificate. [FIXED] Fixed incorrect description for TLS 1.3 cipher suites. [FIXED] Fixed new messages not appearing when received while Textual is hidden or miniaturized. [FIXED] Fixed a lock appearing next to private messages that are not encrypted. [FIXED] Fixed notifications appearing for the ZNC playback buffer when disabled.